When new mom and lifestyle blogger of Meet at the Barre, Amanda Elizabeth, was planning her son's nursery, she knew exactly the theme and feel she wanted for the entire room. Whites and greys on the walls and soft, comfortable furniture created a space that was a serene place for little Patrick to sleep and grow. But when it came to the closet, there was major work to be done that Amanda couldn't do alone. 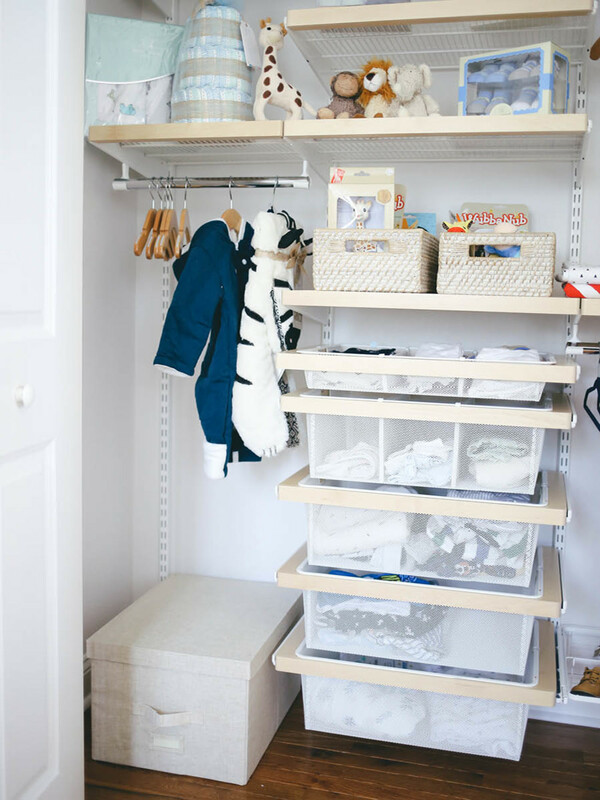 With a quick call into our elfa custom closet experts, and a few designs, Amanda soon had a new closet perfectly suited to her and her little one's needs. Check out the entire space, below! elfa birch decor Shelving was in keeping with the light and airy feel of the space. Each thick-profile shelf helped to both store and display favorites and necessities. 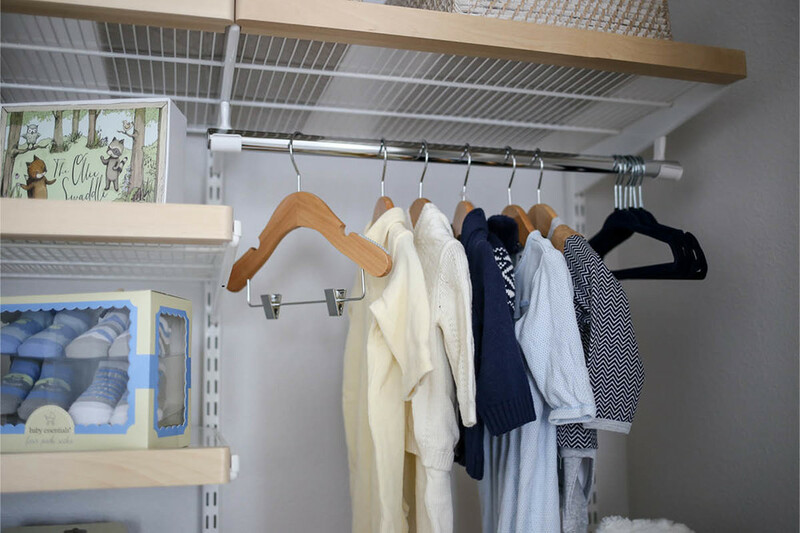 A mix of Infant Non-Slip Wooden Hangers and Kid's Huggable Hangers worked to neatly hang all of Patrick's little outfits, plus created extra room to add to the collection as he grows. A bank of white elfa Mesh Drawers quickly became Amanda's favorite piece in the space. "I love the drawers! I have all my "next size" ready to go up there and I just rotate them as he has been growing into them. I use the largest basket at the bottom for the clothes he has outgrown. That way I can sort them for friends or for potentially baby number 2!" She says. Linen Storage Boxes are large enough to store overflow baby needs like extra diapers, burping clothes and blankets. 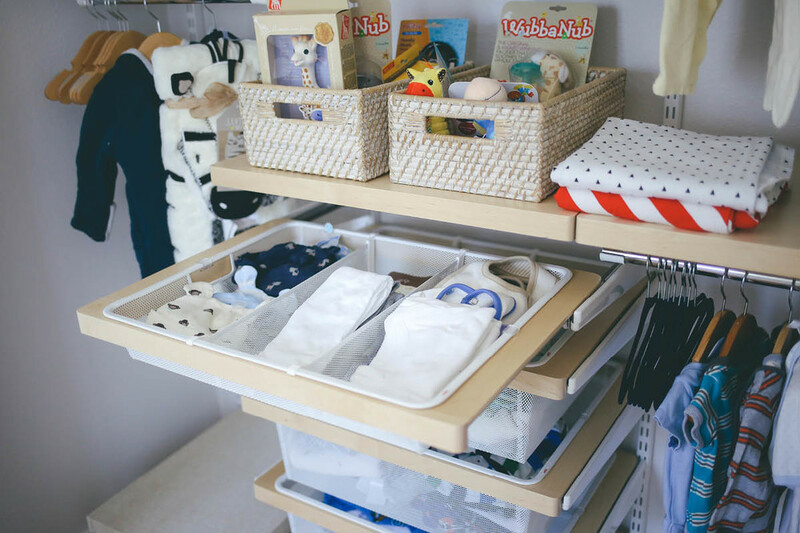 Dividers within the elfa Mesh Drawers make it easy to organize the smallest items like infant onesies, little socks and more. They're easily removable and come in depths for every drawer. 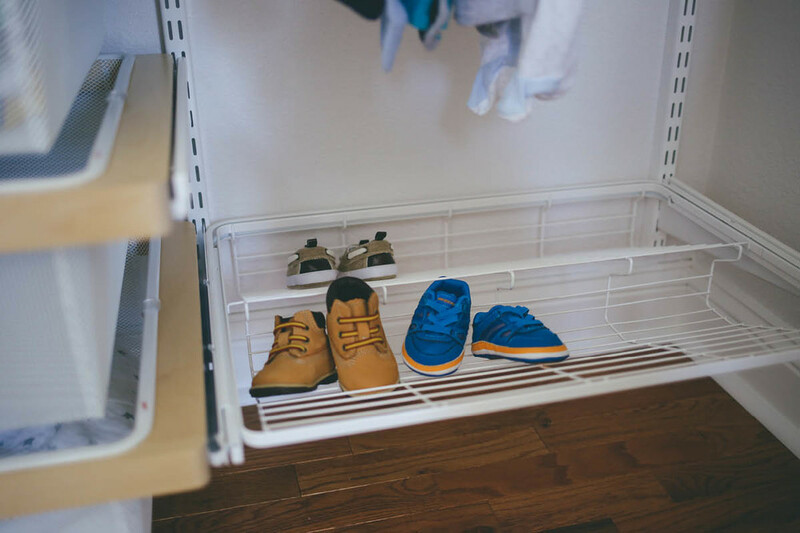 White elfa Gliding Shoe Shelves are perfectly designed to store Patrick's little shoes. They pull out for easy access to anything stored and save tons of space. When reflecting back on what this space has done for Amanda and family, she had this to say. "I absolutely love how much space the system has given me. It was a pretty standard sized closet and now I feel like I have custom walk-in closet approach. I am able to see everything that he has, and with all the different sections I am able to organize his clothes by age/sizes and then all the other accessories babies come with (blankets, hats, socks, stuffed animals, carriers etc)," she said. "It has really made finding and storing his clothes so much easier; both things I need as a sleep deprived first time mommy. I highly recommend people look into this type of organization for their kiddos room," she continued. Thanks for the love, Amanda! Check out her own post on the room's transformation, here!